This is the inside of a modern cockle shell (Dinocardium vanhyningi) found on a beach in Wilmington, North Carolina. 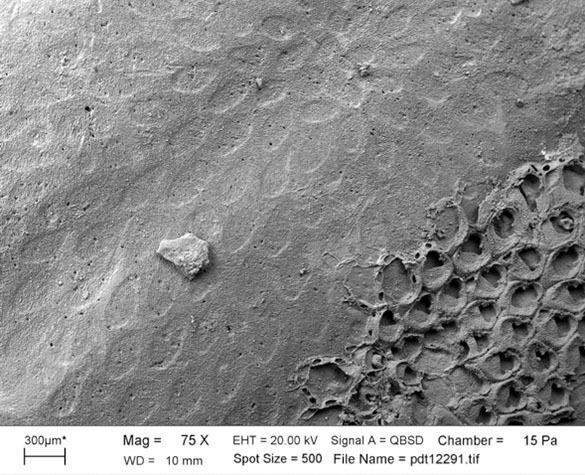 Across the surface is a radiating series of pits, each of which was formed under a zooid of an encrusting cheilostome bryozoan colony, much like Ropalonaria described last week. This etched shell gives me an opportunity to tell a cautionary tale of trace fossils, slugs and taxonomy. This scanning electron microscope image was taken by my friend and colleague Paul Taylor at The Natural History Museum in London. It shows a cheilostome bryozoan etching (the elongated pits) across a shell surface very much like the modern shell at the top of the page. 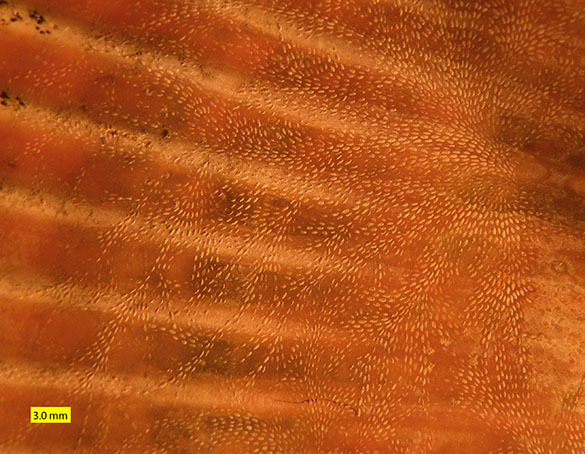 In the lower right is a bit of the cheilostome bryozoan Amphiblestrum. This particular bryozoan did not make the pits themselves (it is oriented in a different direction), but another colony of the same species likely did. This assemblage comes from the Coralline Crag Formation (Pliocene) exposed in Broom Pit, Suffolk, England. In 1999, Paul Taylor, Richard Bromley and I published a paper in the journal Palaeontology describing these bryozoan etching pits as a new ichnogenus (a category of trace fossil) with a Late Cretaceous to Holocene range. We invented (or so we thought) the name Leptichnus using the Greek roots leptos (‘flimsy, delicate, subtle’) and ichnos (‘track, footprint’). It was a fun little project, and we provided a useful name to embed this fossil in the literature. This past fall, thirteen years after publication, I decided to write a Fossil of the Week entry on Leptichnus. In my innocence I searched Google for “Leptichnus” and was very surprised to find it has a Wikipedia page — and it was an East African slug! Yes, the beautiful name Leptichnus was preoccupied by a urocyclid terrestrial gastropod, Leptichnus Simroth, 1896, found in Kenya and Tanzania. 1896 is a long time before 1999, so Simroth’s name has priority over ours. The ichnogenus Leptichnus Taylor, Wilson and Bromley, 1999, thus became a junior homonym of the gastropod genus Leptichnus Simroth, 1896. We had to come up with a new name for it. 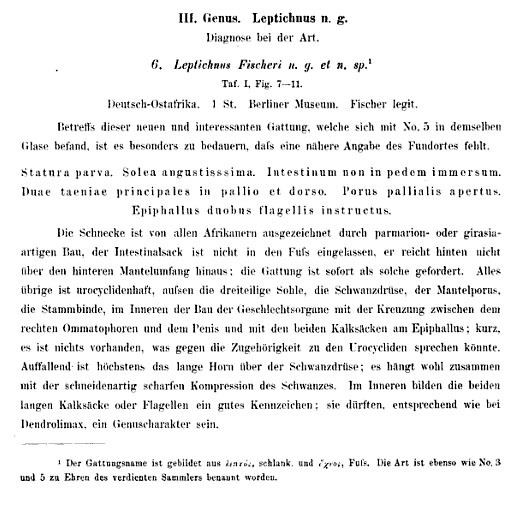 Above is the original 1896 description of Leptichnus The Slug by Heinrich Rudolf Simroth (1851-1917). He apparently came up with the name because this shell-less snail left a subtle trail behind it when it slithered. It is the first time I’ve seen the -ichnus suffix used for anything but a trace fossil. Herr Doktor Professor Simroth was a German zoologist and malacologist educated at the University of Leipzig. He was a schoolteacher for his whole career, doing prodigious research in his spare time. His speciality was, unsurprisingly, terrestrial slugs. He worked on specimens brought back by scientific expeditions, including one in the short-lived colony of German East Africa. It is from this collected material he described Leptichnus. Simroth’s type collection was long considered lost, but many specimens were recently rediscovered in Berlin (Glaubrecht, 2010). These do not, alas, include any representatives of Leptichnus. 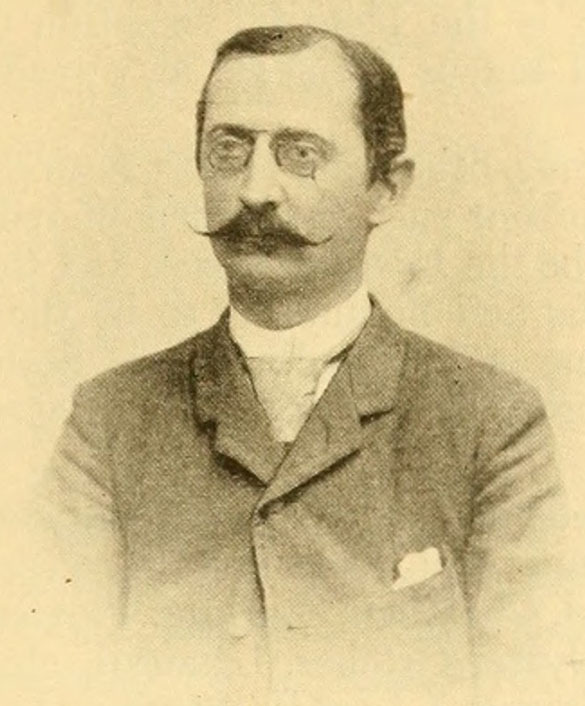 The image above is of Simroth in 1902. Taylor, Wilson and Bromley (2013) proposed the new name Finichnus to replace Leptichnus Taylor, Wilson and Bromley, 1999. To preserve the meaning of the original name, we substituted the Greek finos (‘fine, delicate’) for leptos. The lesson of this story? Search, search, search for homonyms of new taxonomic names. In our defense, searching wasn’t as easy back in the 90s (Google’s search engine came online in 2000, for example, and Wikipedia began in 2001). At least the adventure introduced us to Heinrich Rudolf Simroth and his slugs! Glaubrecht, M. 2010. Slug(-gish) science, or an annotated catalogue of the types of tropical vaginulid and agriolimacid pulmonates (Mollusca, Gastropoda), described by Heinrich Simroth (1851–1917), in the Natural History Museum Berlin. Zoosystematics and Evolution 86: 15–335. Rosso, A. 2008. Leptichnus tortus isp. nov., a new cheilostome etching and comments on other bryozoan-produced trace fossils. Studi Trentini – Acta Geologica 83: 75–85. Simroth, H. 1896. Über bekannte und neue Urocycliden. Abhandlungen der Senckenbergischen Naturforschenden Gesellschaft 19: 281–312. Taylor, P.D., Wilson, M.A. and Bromley, R.G. 1999. Leptichnus, a new ichnogenus for etchings made by cheilostome bryozoans into calcareous substrates. Palaeontology 42: 595–604. Taylor, P.D., Wilson, M.A. and Bromley, R.G. 2013. Finichnus, a new name for the ichnogenus Leptichnus Taylor, Wilson and Bromley, 1999, preoccupied by Leptichnus Simroth, 1896 (Mollusca, Gastropoda). Palaeontology (in press).